Most of us are probably familiar with the Winston Wolf adverts run by Direct Line Group, in which the Pulp Fiction character comes to the rescue of those who are insured by the company and sorts their problems with a no fuss, customer first solution. What you may not know is that they mirrored this brand messaging internally, encouraging their employees to ask themselves “What Would Winston Wolf Do (WWWWD)?” when dealing with customer claims and problems. The effect of this was an increased Net Promoter Score. When a company develops a better reputation with customers, they are more likely to attract and retain employees. After all, not too many marketing and communications professionals would willingly join a business with a reputation for poor customer service. Speaking to a senior marketer a few months back, he explained to me that he had been part of a high-level group of both senior marketers and representatives from top global consulting firms. The aim? To work out the biggest factor in improving the customer experience for any sector. The answer? Employee satisfaction. After all, these are the people who live and breathe your brand values day in and day out - they are the ones who interact with your customers. If they enjoy working for the company and believe in what it does internally, as well as externally, they will perform better and stay longer. I would suggest that marketers are the ones who are most highly attuned to this, after all, the brand and its communications are their profession. When they think about their career, it’s important for them to be working somewhere that they feel marketing is taken seriously. Not to mention that the brands that are viewed as having strong messaging tend to attract better talent when they are hiring, as marketing professionals want to work for companies that have a clear brand purpose and direction. As an employer who values marketing and its ability to increase organisational performance, it’s important to ask how you are reflecting this internally – do your employees know what the brand journey is going to be and what their part in it is? The next generation of marketers are highly ambitious and actively seek new challenges. With this in mind, how do you attract people in the first place in this increasingly competitive market for talented candidates? More than ever, people want to believe in what their company does. Therefore, your purpose, mission or ethos must be clear. People want to be fully engaged with what their brand is trying to do. This starts with strong external marketing but is only fully effective when that is mirrored with adequate internal communications and branding. Here are the key messages that should be communicated to increase employee satisfaction. Some of the leading marketing graduate schemes give employees roles that are impactful early on in their employment, rather than excessive training courses or jobs without much accountability or responsibility. These companies tend to have better retention rates and also attract more talented applicants. Giving people a sense of purpose in their roles, as their efforts are making a direct impact on the company, evokes a sense of personal development for the individual and adds value to the company. This helps to strengthen loyalty among employees. If you have personally experienced growth within a company, you are less likely to take the risk of moving to another if there is still more to learn and opportunities for more growth. In such a competitive market, potential employees aren’t just waiting around to be interviewed for any job that comes their way, they also need to be sold on the role. This includes what the company is like and why it’s a good place to grow their marketing career. Discussing challenges within the company or marketing team with candidates can be an effective way to highlight the opportunity to make an impact and contribute to purposeful change. These challenges can range from championing marketing internally, lack of sophistication in certain marketing channels, new team structures etc., all of which can represent an opportunity for improved performance and growth. 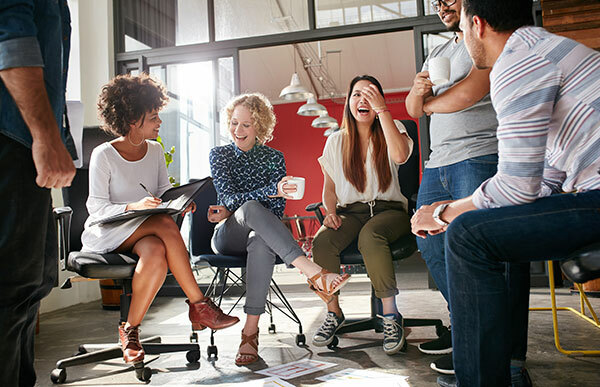 Diversity within organisations is something that is talked about in many guises, but for a marketing team, it can be especially important from the view of utilising different personalities and backgrounds. Diversity in marketing helps to create a team that drives creativity and innovation instead of one that over time becomes stale or trapped in a fixed mindset of ‘this is the way things have always been’. People from different backgrounds, professionally and personally, will have developed different ways of thinking and taking action due to their unique experiences throughout their education and careers, as well as naturally having different strengths/thought processes. An environment that is unchallenging and unchanging is not only detrimental to the marketing programme but it can also create a feeling of lack of progression for the individual, as well as the team. In a marketing week survey*, nearly 70% of marketing employees stated a lack of opportunity to progress as the main element when considering a career change. While there is a growing demand for flexibility in work hours and location, it’s a fine art to execute this correctly. It can increase employee performance and satisfaction in one fell swoop but just being flexible is no guarantee of this. For marketing professionals in particular, belief in the brand and strong internal messaging, along with trust and autonomy can lead to improved retention, attraction and performance. Most employees value a healthy work-life balance but for many professionals, flexible working doesn’t necessarily mean working fewer hours – particularly if you are part of a start-up or rapidly evolving business. Our latest trends research has revealed that over half of Generation FL-X (those aged 18-27) expect flexible working to be offered by employers as a standard. Employees want to be trusted to get their work done with the freedom of not being fixed to a desk for what can sometimes be an arbitrary time frame. There are, of course, reports about reduced hours increasing productivity and it’s something to be taken seriously, though it needs to be very carefully applied. Where employees have a genuine passion for the brand and believe in what the company is trying to achieve, they are most often highly engaged in their tasks during work hours and so also tend to have a high output on a consistent basis whilst working with flexibility and freedom. For the majority of the top brands we work with (both large and small), there is a common theme that clearly distinguishes their job adverts - they communicate what the business is trying to achieve clearly. Their overall values and purpose for the company and the role are communicated well, both internally and externally. For marketing candidates, a good job description translates to a company that cares about the way they recruit, that wants to increase communication with their employees and a business that is genuinely excited about what they do and what they are trying to achieve. Job adverts, to marketing professionals, are likely to be used as an indicator of how much thought and importance the company places on their own marketing and communications teams on a day-to-day basis. The same applies to strong branding in general, 20% of companies with a good employer brand for marketers, view external advertising as being a key element for employee retention and attraction. There are many elements that need to come together to increase retention, some simple and some far more complex. But to summarise it; mirror your external messaging and quality of customer care internally. If you want your customers to stay and you want to attract the best talent, then shift your focus to your current employees. For more information or to discuss how we can help with your recruitment needs, contact your local Michael Page office. Alternatively, submit a job spec and one of our expert consultants will be in touch. *Requires registration to view content.